Will you walk the line between life and death, or will you choose a side, against your own nature? Even among the planetouched races, the reapers are outcast. The children of psychopomps and humans, reapers see the world from both the perspective of the living and the dead. Details on reaper adventurers and reaper communities as well as suggestions on how to incorporate this mysterious race into your world. Be heroic with this new race today! Early yesterday I got this pdf as a gift. Cool because I'd been curious about the Book of Heroic Races line after using the entry on Seedlings. This is a bit more in depth because there are no reviews on it here on Paizo so I feel the need to give would be consumers useful information. The PDF starts off with some prose to give you an idea of how the life of a Reaper may go. Then it's off to the race itself, the Reaper. Reapers are sort of your psychopomp answer to tieflings or aasimar. They have the blood of death in them. The fluff around them doesn't make them really distinct in appearance, so they aren't terribly dynamic but they feel an affinity towards death and it shows in their racial traits. As a whole the reaper race isn't something I would stick in any campaign. They die a round later than a character normally would, they get bonuses to some social skills towards psychopomps and undead and can deal damage to ghosts and haunts as a racial trait. The social skill bonus feels weak since they get a penalty to charisma in the first place but since they can straight up get ghost touch on their weapons, which is situationally overpowered, I guess it's okay. They also can sense anything dead or alive within five feet away which I wonder exactly how powerful it is. They also get a situational bonus to saving throws when wearing masks. In the right campaign the basic racial traits can be powerhouses or somewhat useless making them kind of slaves to their flavor instead of something that can be shoved in anywhere. The traits and Alternate Racial Traits follow this theme by being really ingrained in their theme while also alleviating some of the more situational abilities. They get Favored class options (interesting ones) and Height/Weigth/Age tables before getting to some class racial options. A druid archetype I notice has the Associated Class/race listed first along with the replaced and modified class features... Why aren't archetypes listed like this, like all the time? Anyway it's pretty much a death druid which is interesting, with all the nature theme I would have thought that I could think of death themed druid off the top of my head so the archetype is unique and helpful. There's a new psychopomp bloodline and two new subdomains. All seem pretty worth taking. There's a 5 level prestige class if you're into that sort of thing. Not great, not terrible. Doesn't gain anything terribly interesting. There is also a 10 level prestige class that gets heftier bonuses and is more interesting. There are a number of racial feats centered around masks and racial/class features that revolve around masks. There are new mundane items that encompass the theme well enough. There two new psychopomp deities that feels sort of like Pharasma divided in two. The new spells are interesting but nothing that will ruin or really change your campaign although there is an interesting cause fear-like effect for undead. Then there are new magic items some reaper NPCs and a ton of more lore. Because of how the race runs the definition of this PDF is flavor, flavor, FLAVOR. I never was interested in introducing a psychopomp native outsider race but if I wanted to this book gives a crapton of things to work with. Racial traits, class options, deities, feats. The race itself borders between powerful and situational. If there is a lot of death, whether or not it's walking around, reapers are at home and have a lot to do. In happy fun time situations not so much, plus their flavor lends more to grimmer campaigns than others. Introducing a race I didn't care about and making it something that I can definitely use in future horror campaigns does deserve some praise and there are no typos-ridden, unclear, broken or fundamentally weak options that I noticed so I feel comfortable giving this five stars. If you aren't into a race who's options are more metal than an auto shop (seriously they take the death theme and run with it. If you use all the options you're pretty much a real psychopomp in later levels.) then this product is for you, but if you want a death/psychopomp race in your campaign I can't think of a race that is as detailed, especially when it comes to the fluff. Reap a whole new experience with this race today. •Details on reaper adventurers and reaper communities as well as suggestions on how to incorporate this mysterious race into your world. Ooh, this all sounds fascinating! The race seems well suited to a 'white necromancer' theme, especially stuff like the psychopomp bloodline and subdomain, and the spirit guide PrC. I hope people are enjoying this as much as I enjoyed writing it! I'd like to offer a little extra freebie to anyone who is enjoying this book--make a vote for any of the NPCs mentioned in the book by posting here, and once we have enough votes, I'll fully stat out the winning NPC. Darn it! I've been looking for something like this for ages...and I have to wait til payday! Well, you can definitely still vote based on the short info I provided in the Spoiler block, and if you change your mind come payday, then no problem! Well, bladeblound is already an archetype, and I don't remember seeing any archetypes of archetypes so far. That said, it could be a pretty awesome character, though you'd need a feat or a trait or something if you wanted to use a scythe, since it's not normally spell-combat-able. Maybe a sickle? I'm pretty sure the archetype was made with Moorcock's Elric and Stormbringer as the primary influence, but you're right that it could be used to mimic elements of Bleach or other anime. That's actually a really cool idea, Bardess. My friend is starting up a campaign where all of the PCs are reincarnated servants of Pharasma, so this appeals to me. In the book, although sometimes Reapers are the descendants of psychopomps, they also come about when touched by the afterlife in some way, so this is a perfect fit. You can make the easy substitution of Pharasma for all mentions of the goddess Persene, the Lady Judge in this book. If your buddies and GM are in for it, all reapers could be pretty awesome for your GM's campaign. If you do play a reaper, let me know how it goes! Right now, my girlfriend is having a blast with the beta dusk druid in Jade Regent. I give my vote to Alistair, though Flora seems intriguing too. With the upcoming I'm Not Going to PaizoCon Sale, you can grab this imaginative and flavorful race that straddles the line between life and death for your Pathfinder game. 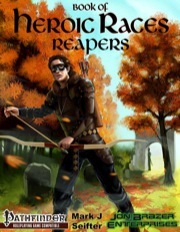 Book of Heroic Races: Reapers will be going for $1. The sale starts tomorrow. Add this to your cart today. The I'm Not Going to PaizoCon Sale is on right now. Grab Book of Heroic Races: Reapers for $1. Excited for Planar Adventures? The Reapers are a half-psychopomp race that you can play today. Download now.